No, Kwanzaa is not the Black Christmas, Black Hanukkah, or an African holiday. Despite the popular media portrayal of Kwanzaa as simply the third of the year-end holidays, Dawn Hicks Tafari of the Greensboro Kwanzaa Collective explains that Kwanzaa was birthed out of the black freedom struggle of the 1960s. Kwanzaa was ”a response to oppression, an effort to say, we love who we are. We are going to be united, to strengthen our communities, to reunite with the motherland and to embrace the principles and languages of Africa. That’s an act of resistance right there,” says Dawn. 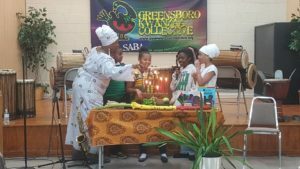 Dawn was one of the founding members of the Greensboro Kwanzaa Collective, which has organized a seven-day celebration in Greensboro for the past eight years. After moving to Greensboro from Baltimore, Dawn and her family began hosting Kwanzaa celebrations at their home. The Kwanzaa celebration culminates with a big feast, called karamu in Swahili. Over the years, more and more people wanted to come and the karamu feast outgrew their home. The Greensboro event started when Dawn and her husband partnered with their friends JamillahNeeairah Nasir and Nia Hendrix-Wilson to expand the celebration. “There was a thirst and hunger here in Greensboro,” she says. Dawn, Jamillah, and Nia decided to organize a community wide event. 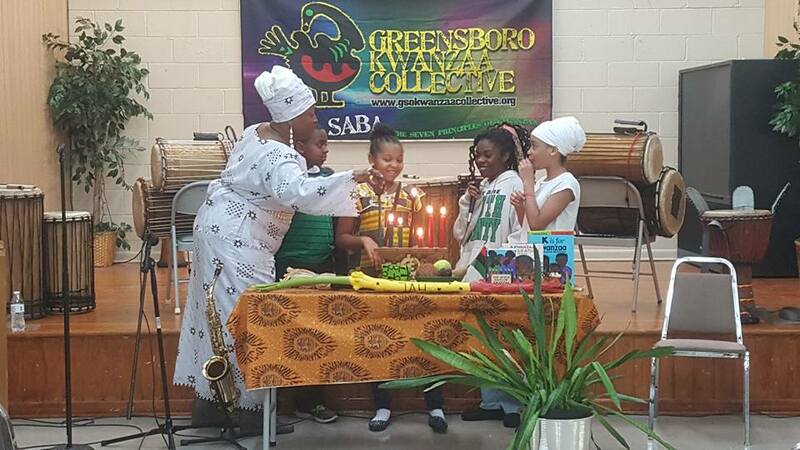 Along with Tonya Poole and Dandara Boyd, they formed the Greensboro Kwanzaa Collective . Together they have sponsored a seven-day Kwanzaa celebration in Greensboro every year since. The seven day celebration focuses on the seven principles of Kwanzaa: umoja (unity); kujichagulia (self determination); ujima (collective work and responsibility); nia (purpose); kuumba (creativity); imani (faith); and ujamaa (cooperative economics). On each of the seven evenings, there is the “customary libation”, along with candle-lighting, storytelling, drumming and dancing and an African Marketplace. Inspirational speakers focus on the principles of Kwanzaa and help participants think about how they can embody the principles in the year ahead. Today, the three friends’ idea has grown into Kwanzaa 365 with a year-long focus to teach the principles of Kwanzaa, to link up African American cultural programs, and to provide a meeting ground for the community. The Collective’s partners include cultural and social justice organizations in Greensboro like the Indigo’s Cultural Arts Centers , Greensboro Artists 4 Justice, Wombmen’s Temple , and Black Girls and Women Matter. This year’s Greensboro celebration runs Dec. 26 through Jan. 1 at the Bethel AME Church on Regan Street in Greensboro. More information about this free event is available at www.gsokwanzaacollective.org . Other Kwanzaa celebrations in the state are being held in Durham, Cary , and Charlotte .